Are You Ready for Business Black Friday Weekend and Cyber Monday? The holiday season is a great time to sell products and services. According to a survey conducted by the National Retail Federation, the average person will complete about 39.5% of their holiday shopping online. (up from 38.8% last year). Additionally, Shop.org, (the digital division of NRF), is forecasting that online holiday sales will increase between 13% and 15% to as much as $82 billion during the months of November and December. So what does that mean to online marketers? How can we make the most of our websites to gain a piece of this eCommerce? Six fewer shopping days between Thanksgiving and Christmas this year is predicted to result in a potential cut of $1.5 billion dollars in potential online sales. Online sales this shopping season are expected to grow by 12%. If the Thanksgiving day trend continues, it is predicted that (within the next 5 years) retailers are expected to sell more online on Thanksgiving Day than on Black Friday. It is predicted that retailers will transact more than 20% of their online sales via mobile devices. 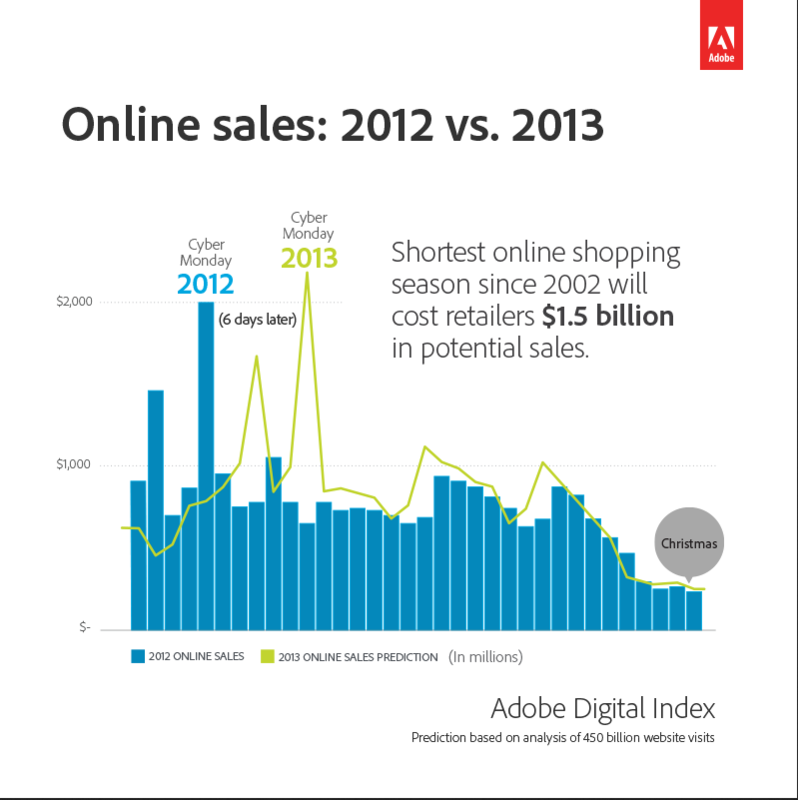 Adobe Digital Index 2013 from “Thanksgiving is the New Black Friday” published on www.cmo.com. Add a holiday specific product or service. Incorporate holiday graphics into your emails and newsletters. Add a holiday graphic to your blog/website and Facebook page. If you offer a service, promote gift certificates. One of the things that I want to remind everyone to not forget is PPC (Pay-Per-Click Advertising). I’ve written a series of posts before on PPC (Pay-Per-Click Advertising) and I still maintain that it can be a very affordable and effective method of advertising. Don’t be afraid to try it. You just need to keep in mind a few basics (which I’ve covered before and will again). So, over to you. Do you run special promotions around the holidays? What tips and ideas can you share? Have you thought about running a special holiday promotion for a product or service? Note: This article was originally published in November of 2011 and has been updated to reflect data from the 2013 holiday season. Bying online is something we do more and more. Why do I have to pay twice as much for vitamins in a store as online? And the online price includes being sent from the UK to Sweden. It’s really sad for retailers since they have a tough time. Rents are getting higher and higher and customers are in decline. Shops hence have to start providing that little extra if they want customers to keep on coming. A sour shop assistant should become a thing in the past. Some attraction such as fitness assessment in a health food store will be needed in order to get the upper hand on their competitors. Catarina recently posted..Will JFK & Jackie always be icons? Catarina, You bring up a great point about shop owners needing to provide a little extra. A fitness assessment in a health food store is an excellent suggestion. It is sad to see stores closing because of the online prices. We try to patronize local stores when possible but other than a stack of DVDs (that were on sale at a very competitive price), we almost always immediately go to eBay for our technology needs. It’s unfortunate but we can usually buy storage media and electronic “gizmos” at a fraction of the price that we’d find it at our local Best Buy (basically the only computer store left in this area). Then again, Best Buy is starting to be more competitive. So, maybe the tide will swing a little. As always, thanks for dropping by and adding to the conversation. It’s the simplest things that can catch someone’s attention, isn’t it? This is a very good reminder of some things I should doing right now. I work so hard to help others I sometimes forget to do that for myself. Thank you for the extra push. Thanks for letting me know that it was the little push that you needed Susan. Good luck and thanks for dropping by! When you offer promotions or discounts it’s also worth publishing a press release to advertise it. This should attract extra people to your site. Warren, I agree with you that it’s good to mix traditional marketing strategies with online marketing strategies. Thanks for taking the time to leave a comment. These few days every year remind me how exciting shopping can be. It’s not really about the low prices, it’s the feeling you get. 🙂 It is tempting to buy things that you didn’t know you needed or wanted because it’s such a good deal. Hi Sherryl, Very good websites ideas. I should try to use some of these ideas for the next holiday season. Thanks for letting me know that you found some of the ideas helpful. Good luck with them if you try them. Great post and great ideas. I especially liked your website ideas. It’s those extra little things that make a big difference (holiday graphics). I’m going to make some of these changes thanks to your post! I’m so glad you endorse the idea of using holiday graphics Dennis. I’ll be over to you site to check it out. I think the idea about using a relevant graphic is quite important, as it can be an attractive factor for a casual visitor. If anyone could mimic google in catering for numerous festive days for its international audience, I think they will make strong headway in eCommerce. Sherryl Perry recently posted..Where Does Your Website Traffic Come From? Sherryl — It’s like the shoemaker’s shoes with holes in the soles. I suggested a blog to a client tied to the holiday season, which I wrote. But I didn’t think to write one for myself. Thanks for the reminder! That’s a great analogy Jeannette! I often say that I’m going to schedule time for myself as a client but it never seems to happen. There are so many great apps to help shoppers make their buying decisions. One of my favorites is the app that you can use to locate the least expensive price in the area just by scanning the bar code. Then, Google maps will show you how to get there. Even better is if you’re in a store that will price match. Retail has become even more competitive now than it used to be. Interesting and informative as always. Someday I will get to the place where all this will be useful. Meanwhile, I stay away from all the hype of the “giving” season. I give of myself all the time because that is what fills me with joy. The rest is just stuff! You are a “giver” in many ways Bill. By reading your blog, I know this to be true. You are so right that all kind of media (internet, tablets and smartphone) are irreplaceable in today’s life. And we must use all these and take advantage of them in order be more successful! It’s definitely a more competitive environment than it was years ago. It’s a global marketplace in many ways. Sherryl, My blog isn’t really geared toward sales (other than my book) but I did sign up with Google’s Adsense. I’ll have to read up on that from you as it just seems to take up space and not do anything. 🙂 I am one of the Black Friday shoppers but I’m in it more for the fun experience with my daughter (although if there’s any more pepper spraying incidents, we’ll definitely move to 100% online shopping!). I do love how your commenters add so much to your post. Always a good read. Thanks! Trish, I know some people make money with AdSense ads but I am not a fan. I much prefer to see affiliate ads where (hopefully) the blogger has vetted the vendor and believes in the product. Personally, I have much less trust and respect for AdSense ads. It’s a matter of opinion but your readers know and trust you. You know your audience. If you wanted to add ads, you could hand select a few products that you believe in and become affiliates for them. Something to keep in mind (and you probably already know this) is that e-products tend to offer much higher commission rates than physical goods. Yes, I do special promotions during holiday season. I send out newsletters to customers to promote the products that will be sold the most during holiday season. I also have special discounts for regular customers. Do you have any tips that you can share with us? I’d be interested in knowing if you choose the products that you promote based upon what sold during the same time period the prior year. Also, do you include any special pricing or offer something that you normally wouldn’t like free shipping? Any insight that you could offer us would be greatly appreciated. Thanks. I haven’t done anything holiday themed or directed to Black Friday, but I want to keep an open mind about growing in the future, so I read this with interest. I have some negative feelings about the whole Black Friday thing and the frantic holiday shopping rush, but I also want to live in reality! I read the e-mail specials I get, so I can’t say I’m unaware. Maybe in the future there will be a place for this for me. Judy, I honestly haven’t incorporated these tips into my blog yet. I think most of my suggestions lend themselves more to bloggers and business people who are promoting products. There are definitely opportunities to build excitement through the use of seasonal graphics and messaging. Great post, Sherryl. I hadn’t really thought about trying to upsell on the holidays but now you’ve got me thinking. Maybe a sale of my book as a Christmas present. Or maybe even bookmarks etc. Thanks!! Sherryl Perry recently posted..Want Ideas to Promote a Niche Ecommerce Site With A Blog? There is an attraction to using Christmas pics and graphic in our blog posts too. I’m sure I’ll be searching soon too. I’m not a fan of crowds, especially when they make you feel like running in a battle royal marathon. So i guess i’ll stick to online purchases this year too, i have my eye set on a few domains which should prove useful in the near future. What a great idea to buy domain names for gifts. Would these be gifts for yourself or someone else? Why not both? At that price… though it’s difficult buying something like this for other people, you have no way of knowing if they’ll like the name and the niche. Sherryl Perry recently posted..Could Your Business Survive if Something Happened to You? I am not into the whole holiday thingy either (especially the insane Black Friday shopping) BUT I am a business owner and it is what it is, the holiday season provides the best sales’ opportunities and I am planning to offer 20% off on all my products this Friday. Thanks for the great list, as always spot on!! Thanks so much for your kind words. I’ll have to pop over to your site and check out your 20% off offer. That’s wonderful that you’re supporting your friend by buying and giving her book as a Christmas gift. Great idea! I don’t have an e-commerce site, but for those who do these are great suggestions. And I wish all you small business owners Huge success this Small Business Saturday! I loathe the consumerism of Black Friday and never participate. But I will spend some dollars with local merchant and small online companies this weekend. We vote with our spending dollars, and I vote for independent, small businesses! Happy Thanksgiving to you, Sherryl. I second your feelings about consumerism. I love the email that’s been going around with suggestions for gift giving that includes supporting our local businesses. As the email says, who doesn’t need to get their hair cut? Great suggestions Sherryl! I need to dig out my Santa hat and update my profile pic in a few places to keep the spirit going. Hesham decided to do a Black Friday offer on his Thesis blogskins and I added a bonus deal for my readers. It’s just a small way of showing my readers how much I appreciate them. I think I’ll try to incorporate a few more of your tips before the year is out. Thanks. Hesham always does a great job with his offers. I don’t invest a lot of money into my blog but I have purchased blogskins for Thesis through him before. 50% off is a great deal. Thanks for sharing the link. I’ll have to go back and do some shopping for myself. Instead of running a full-fledged ecommerce site, why not an affiliate site that frees from you all the hassles of managing the complexities of an ecommerce site. Mini 1-page sites to promote affiliate products are a great example of simple ecommerce sites. These are the type of sites that I most often see spruced up for the holidays. I often tell clients that they don’t need to spend a lot of money to add ecommerce to their site. PayPal is definitely an affordable option. My friend started to check out black friday deals and seems like she was able to get a great deal for a wonderful HP printer. It’s absolutely cheap and great features as well. No doubt, many people will surely enjoy this upcoming celebration! Good suggestions Sherryl and themed promotions can work well especially if they are integrated online and offline. One thing I would add if a company is going to have special offers is to do the sums first before settling on a price. The reason for this is to make sure you know the extra volume you have to sell at the reduced price. Susan, Thanks so much for reminding us to always keep pricing in mind. We don’t want to be so aggressive that we’re giving away the store. Your comment reminds me that we need to not over promise too. I wouldn’t want to promote an offer that created a demand that I couldn’t fill. That could severely harm my reputation. As always, I appreciate your comment. Sherryl you are so right that people are increasingly buying online. Even in countries like Saudi Arabia. There are lot’s of things online companies can do for the holidays. Your suggestions are good. I will however not add a holiday graphic to my blog:-) But many bloggers and online businesses would benefit from doing so. Catarina, If I went to your blog and saw a holiday graphic, I might think your site had been hacked. 🙂 It certainly would not fit. I agree with you Catarina, people are increasingly buying online and this going to be more in future. As I think I have mentioned before, I deal largely with SME’s and one message that I always try to get accross to them is this. Even if people don’t buy directly from the website it does not mean that your website has not made a big influence on them to buy from you. There are countless people who for whatever reason do not buy online but do use the web to research products and services before going instore to make their purchase. Presenting your business well online will often put you at the front of the que when these wary consumers go shopping. Glad you enjoyed the article. It is a neat little trick and one that has proved to be very effective for a number of my clients. Just a simple idea that plays right into the hands of human nature. Thank’s for your kind words and also for the FB like. Previous post: Copyright Infringement – What Should You Do if Your Blog Post is Stolen?